The list of the Munros covers all mountains in Scotland, which are higher than 3000 ft (914,4 m). They are named after Sir Hugh T.Munro of Lindertis, who published 1891 the first list of those summits. In this list, which contained altogether 538 summits over 3000 ft, a number of 283 were designated as "seperate mountains". All other heights over 3000ft were named as "Munro tops". There has always been speculations according to the criteria, Sir Hugh Munro had differentiated the Munros from the Munro-Tops. In contrast to the Corbetts (summits between 2500 and 3000 ft) only a little precise definiton for the seperate mountains was given. According to the valid rules there must be a reascent of at least 250 - 350 ft between two summits over 3000 ft, otherwise the lower one will be just a Top. The rules for the Corbetts are a reascent of at least 500 ft (ca. 150 m) and a distance between the summits of half a mile. In the year 1997 the Scottish Mountaineering Club published a new list, which was based the newest measurements in accordance with the Ordnance Survey maps and comprises 284 Munros. My Munro list on this site is based on this list. Beginning in 2007 the real height of some mountains around the 3000 ft level has been proven by modern and very precise GPS methods. 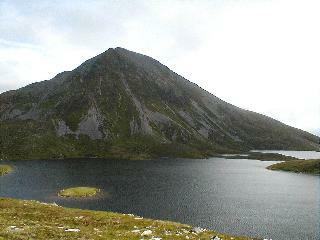 Two Corbetts had been proved in 2007: the Foinaven in Sutherland and Beinn Dearg in the Torridon area. Both did not fullfill the expectations to reach the munro height (Foinaven 911 m, Beinn Dearg 914 m). The new proven height for the Foinaven (911 m instead of 914 m before) lead to speculations about the real height of the Munros with heights till 917 m and by this about their Munro status. This result leads to a change of the offical list of the Munros. The list now contains only 283 mountains. Walkers, who are trying to climb all 283 Munros in Scotland are called Munrobagger. As such one you will become acquainted with regions in Scotland, which remains almost completely locked to the normal tourist. Some Munros are in so remote areas, that they can only be reached in expeditons lasting several days. 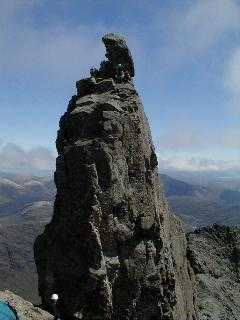 Munroist is the proud title of those, which succeeded to climb all 283 Munros. The Scottish Mountaineering Club keeps the list of the munroists. First person, who climbs all the Munros was a minister A.E.Robertson in the year 1901. 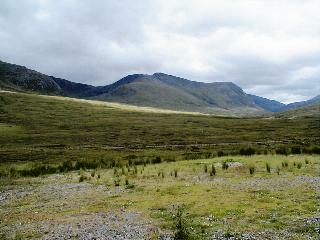 Sir Hugh Munro was unfortunately not able to reach all the Munros of its list. He died in the year 1919, before he could complete the 2 last Munros of its list, the Inaccessible Pinnacle in the Cullins on the Isle of Skye and the Carn Cloich Mhullin in the southern Cairngorms (today only a Top according to the newest list).